We’re keeping our eye on the big picture and are well aware of the impact that transportation has on ecological sustainability, as well as your wallet. Our experience in modal conversion can help you reduce your emissions and fuel consumption. 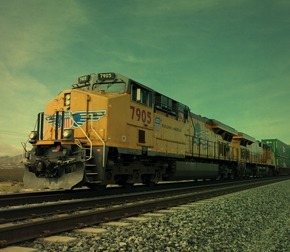 One double-stack train equals as many as 300 trucks, making freight trains nearly four times more fuel-efficient. This not only helps save the environment; it also saves you money. 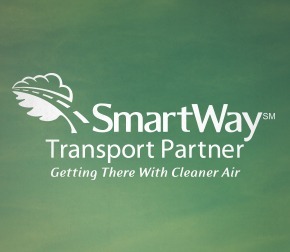 Hub Group supports a relationship between our carrier network, shippers and SmartWay, a public/private partnership between US EPA and the transportation industry. We are committed to SmartWay’s goal of assisting freight shippers, carriers, and logistics companies to help improve fuel-efficiency and save money. A key initiative of Hub Group Trucking is encouraging the use of day cab tractors. By year end, our target is to convert nearly three quarters of our fleet to day cabs, consisting of more than 550 tractors. In addition, some Hub Group Trucking terminals are using biodiesel to reduce our carbon footprint and impact on the environment. 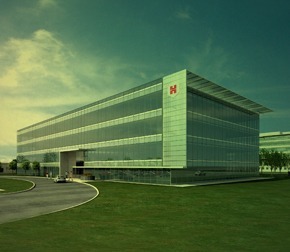 Hub Group’s sustainability commitment continues through our new LEED Gold certified corporate headquarters in Oak Brook, IL, where we re-purposed materials from the demolition of the previous building to protect and restore the nearby habitat, as well as minimize our impact on the environment. Other eco-friendly features incorporated include special parking spaces for electric, fuel-efficient and fuel-conscious vehicles, spaces for bicycles and easy access to public transportation. We built water-efficient landscaping and re-purposed rainwater for reduced water use. The building features full floor-to-ceiling windows that lessen our dependency on artificial light, sunlight sensitive blinds that automatically adjust to regulate natural light and motion sensory lights in conference rooms and offices to ensure lights are only on when rooms are in use. We specifically chose low-emitting materials to lessen our chemical impact including adhesives and sealants, paints and coatings and flooring systems. In addition to achieving top sustainability standards, our headquarters was chosen as an editor’s pick by Crain’s Chicago’s 2014 Coolest Offices and received a 2014 American Graphic Design award for creative interior building graphics.